The court uses a telephone recording system to schedule jurors. 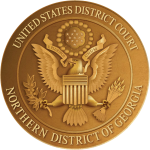 The weekend before your start date, please call the Automated Jury Information System at (404) 215-1501 after 5:00 p.m. on Friday, until Monday at 8:00 a.m. If you are not instructed to report, do not come to the courthouse. Each night of your two-week term, call the automated jury information system after 5:00 p.m. for instructions about reporting the next day. Do this your entire term. When calling for reporting instructions, the status of your request for postponement or to be excused, please have your participant number available. The participant number is a nine digit number and starts with 1-0-1-0, and is located above your name and address on your summons. Please follow the telephone menu instructions. In the event of hazardous road conditions on the morning you are required to report, please call the recording again to see if there has been a change in the reporting instructions.